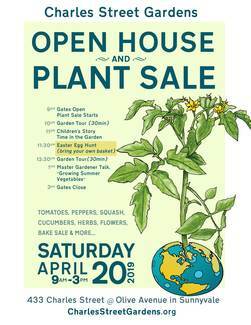 Join your fellow CSG gardeners to help us raise some funds, and have some fun, at this Open House and Plant Sale! It's a great way to meet your fellow gardeners, welcome the public to our beautiful garden, and pick up some great warm season plants for your garden bed. Move plants from greenhouse. Organize plants on tables. Set up cashier tables and pop-up; set up CSG info table; Distribute plant and price lists. Put signs on corners. Pick Up truck needed. Provide items for the Bake Sale. All items must be individually wrapped and include ingredient lablels. Donate filled plastic Easter eggs. Fill with a couple of stickers and non-melting candy. No small toys please. Welcome visitors; pass out boxes as needed. Assist with plant selection. Set up chairs for the Story Time. Hide donated Easter eggs. Collect plastic eggs from children. Welcome visitors. Help locate plants and assist with selection. Pass out boxes as needed. Consolidate plants; break down unused tables and return them to storage; after 3:00, breakdown cashier tables and canopy.